Whether in an urban or a rural environment, I find built history fascinating. It’s all around us, and contains incredible stories about our past, but most people never really notice it. As part of my MA in Public History at the University of Western Ontario I had the opportunity to take a class in interactive exhibit design, taught by Professor Bill Turkel. The premise of the class was simple: create a project that teaches history in an interactive way. With this as my goal, I set about looking for a way to teach people about their local built environment, which would hopefully make them see it in a different way. I decided to accomplish this by creating a digital representation of a streetscape and showing its progression through time. Thus the interactive streetscape was born. My first step was to find a suitable local streetscape. 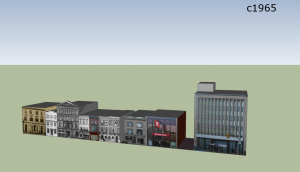 After wandering downtown London and completing some archival research, I chose the east side of Richmond Street between Queen and Dundas, a block which has seen substantial redevelopment while still retaining core buildings. 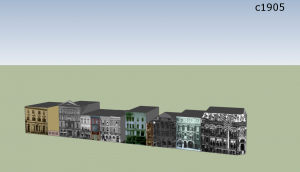 Using Google SketchUp I created 3D digital models of all the buildings that have existed on the street. I used SketchUp as my 3D modeling software primarily because it is free, it is geared towards non-professionals, and it has a very active community, including some very helpful online tutorials. With the models created, I began the interactive aspect. I connected a knob to a small, very inexpensive computer called an Arduino which allowed the user to scroll between images of the modeled streetscapes displayed on a laptop. This required a little bit of coding in a simple programming language called Processing, which is geared specifically towards non-programmers. This project is an example of how history can be told through a digital medium. It was made possible by free and accessible software, active online communities, and the inexpensive but incredibly powerful and versatile Arduino. Furthermore, the technical side is within the realm of possibility for anyone with a willingness to learn. For a closer look at the specifics, including the code I used to make it all work, feel free to check out my website. There are a number of ways I would like to expand the interactive streetscape. If I had the time I would create ways to provide information on the businesses and people that gave life to the buildings on this street. Numerous local institutions are represented here including the London Free Press, the Foresters, Huron and Erie Savings and Loan, and the very first Canada Trust. These companies and the people associated with them were important in the development of London, and what better way to tell those stories than through buildings people see every day. Professor Turkel suggested at one point I use Google Earth as the project interface, which was a great idea. In a perfect world, Google Earth would have an app that allows the user to navigate through historical streetscapes, and contributors could insert their work into the larger framework. As more and more photographic collections are digitized and made available online this type of project becomes closer to reality. 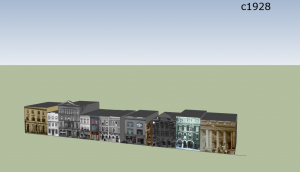 Imagine fully digitized historic environments available online for people to explore. 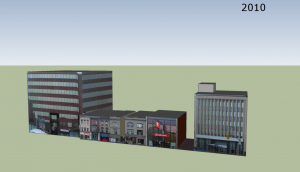 Benefits would include a better understanding of local history and a firmer grasp on patterns of development. Furthermore, by juxtaposing historic streetscapes to the modern vehicle-dependent urban environment, responsible design and planning could be promoted. Tim O’Grady has several years experience in heritage resource management, and is currently finishing his MA in Public History at UWO. His main interests lie in how to incorporate local knowledge to make history meaningful and approachable to the public.